Our charity receives donations of a natural head lice product to help children from families on low income who can’t afford to purchase product. We provide a free head lice removal service at our Whangarei clinic and invite families to contact us on 021 02832854 to make an appointment. Another program we have is our in-school program for low decile 1-4 schools, where, as funding allows, we will provide free product to each school. Schools provide a time, where parents and care-givers can go to the school and treat their children for head lice, either during school hours or after school. As funding allows, the charity will also supply take-home bottles for parents who are unable to make it to the clinics. Take-home bottles can be refilled at the school office. We use a product called U-GO LICE Nature’s Head Lice Expellant. It is quick and simple to use. Just spray it on and leave - there is no need to wash or lice-comb.. This means a clinic session can take as little as three minutes - which makes it an ideal product for in-school use. We also look forward to supplying product to higher decile 5-10 schools who have students that come from low income families. The charity is also taking phone-calls from pre-school centres requesting U-GO LICE. The charity is able to help with product for children from low income families and looks forward to assisting these centres as funding allows. U-GO LICE deals to head lice with ease. U-GO LICE is a leave-on product, which makes it very suitable for the in-school clinic program. Just spray it on and leave. There is no need to wash this product out. There is no need to lice-comb. Active Ingredients: Essential oils of Aniseed, Tea tree, Clove, Eucalyptus, Lavender, Rose Geranium, Peppermint, Rosemary, Cinnamon Leaf and Pine; NZ native plant extracts; All natural cold-pressed plant wax and seeds of Neem and Jojoba. Communities the world over are plagued by head lice. Ancient records show that head-lice have been around for centuries. That they are still with us today gives testimony to the fact that they are seemingly impossible to eradicate. Desperate mothers cringe with despair when faced with yet another head lice problem. Question: Our family gets head lice again and again. Why is it so difficult to keep rid of them? Answer: Head lice are prolific breeders and an extremely resilient parasite. They can live off the human head for up to 24 hours which allows for easy re-infestation. 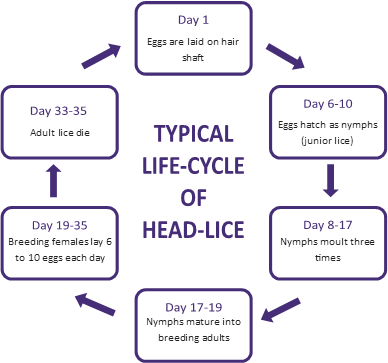 Understanding the life cycle of head lice goes a long way to successfully dealing with these dreaded pests. > Repeated scratching of the head/neck areas. > Finding eggs on the hair-shaft close to the scalp. > Having a large number of eggs means that you have at least one breeding female. She has a 2½ week breeding life before she dies and can deposit up to 160 eggs in that time. > Finding lice crawling through the hair. Newly hatched lice remain close to the scalp for a few days and feast often. They are tiny and not easy to spot. For the first week they practically double in size each day. As they grow they remain a light brown colour except for the adult female who is darker and larger than the adult male. While most parents are concerned about head lice, others are not. Those that choose not to treat their children perpetuate the community problem. Although frustrating, re-infestation of head lice is a common occurrence. How? 1) The school environment is where most persons feel the real problem exists. Young children have few inhibitions and spend a lot of time sitting close to each other in class where head-to-head contact is normal. 2) We can be re-infested by socializing or assembling with others who have head lice. · Being vigilant with weekly checks. · Knowing the early signs of an infestation. · Taking prompt action to treat all members of the family at the same time. · Removing all lice and eggs using an effective store-bought product or home remedy. Caution: If using essential oils in a home remedy, carefully research first as these are extremely powerful ingredients that can cause harm if not used correctly. Delaying treatment can quickly lead to a heavy infestation. If breeding females are not removed they will continue to lay eggs. If incubating eggs are left they will hatch, they will mature and will most definitely lay more eggs- Do not allow this to happen.